From super fine hairlines to big, bold strokes, the Pigma Professional Brush Pen series from Sakura offers the ultimate in versatility. 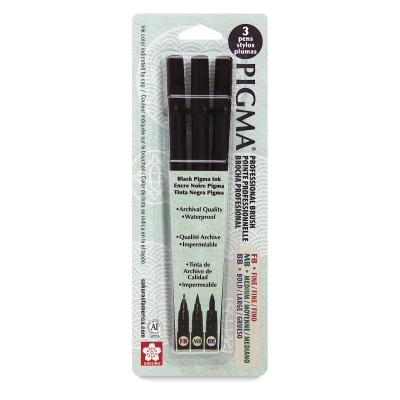 These durable brush nibs were specially developed to provide fantastic bounce and memory over long periods of use. 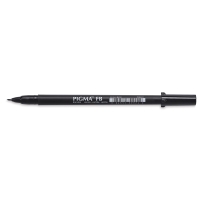 They respond to instant changes in pressure or direction with a silky smooth, accurate, and consistent ink flow. The deep black, archival-quality Pigma ink won't smear, feather, or bleed through most papers. Artists who prefer brushes will appreciate the flexibility of a portable brush with continuous ink flow, avoiding the need to dip the brush and carry messy inks. Manga and comic artists, illustrators, and lettering professionals will enjoy the expressiveness of thick to thin strokes with ease and fluidity. ® Sakura is a registered trademark.™ Pigma is a trademark.